Last fall, I had the opportunity to study the new Oregon Health and Science University’s (OHSU) Health and Healing Center located in Portland, Oregon’s South Waterfront District. Our research project was to investigate different types of roofing used on the building. 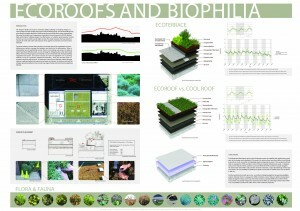 Our group focused specifically on the performance of the cool roof versus the ecoroof. The exciting part is that our poster and brief abstract was accepted by the Solar 2009 conference committee. What does that mean? Well it means our team’s research is getting published! Last year I was also published for the Solar 2008 conference in San Diego concerning our case study on escalator usage in your typical American mall and what that means in terms of energy and money. It is truly exciting and an honor to be invited back again this year to present our work to Buffalo, New York.